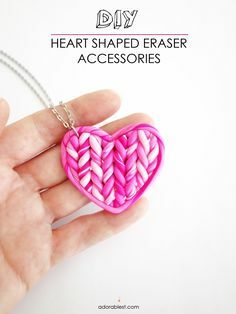 DIY – Heart Shaped ‘Knitted’ Accessories with Eraser Clay. Valentine’s Day is just around the corner … make these for your Galentine’s gal pals! Think they look too intricate? Trust me, they are easy to make and you’ll have them ready in an afternoon, if not an hour or two. They can be made in to many different accessories like a necklace, earrings, brooch and bobby pins. Plus they have the added bonus of being an actual eraser that WORKS! Follow for the full tutorial. 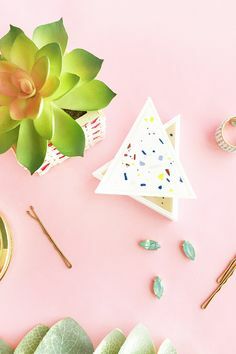 Make these cute heart accessories with eraser clay! What is eraser clay? It basically feels and moulds into shape almost exactly like regular polymer clay, but after baking this eraser clay, it becomes … you guessed it, an eraser. In fact I think it may even be a little more waxy and easier to deal with than regular polymer clay. These look like you spent hours weaving with tiny knitting needles, but there is just one basic technique to giving it the ‘knitted’ look, without actually being knitted. 1. Cut pieces of clay. I chose pink / white to create a knitted wool look. 2. Gently roll into mini sausages of clay on a smooth surface to the thickness shown. 3. You will need 16 to 20 individual sausages and then pair up (8 to 10 pairs). 4. With two joined straight, gently twist them as one evenly – twist FORWARD. 5. With two joined, gently twist again, this time in a BACKWARDS motion. Join. 6. Continue twisting the pairs to make individual little plaits or braids. 7. Use cookie cutter for larger pieces, Gently press down just like a cookie. 8. For smaller pieces, create a simple template with a pen and cut out with scissors. 9. Use an X-Acto knife for clean edges around the paper template. 10. Finish with one long sausage around the heart. Join at top middle point. 11. Bake for recommended time. Let cool, then glue findings to the eraser clay. 12. Let glue dry, then your cute heart eraser accessories are ready for use! How easy is that! Just remember to alternate between twisting forwards and backwards. This is what creates the braided look when they are joined together. Evenly twisting also helps to keep the look real, because the braids line up. With any excess you can easily create the next marble, knit look piece. Just continue to roll your sausages evenly and gently. In the end I only had some tiny pieces left over, so I also made a tiny pair of plain stud (eraser) earrings! 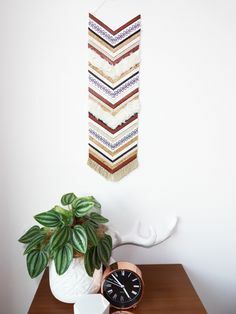 DIY – Boho Chevron Wall Hanging. 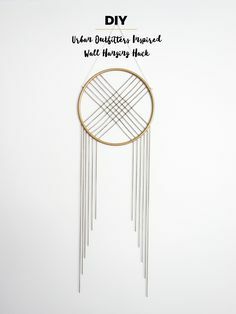 An Easy to make, piece for your wall! Full tutorial to follow. Thank You to Endless Leather. I was sent some samples to try and use in a DIY Project. I was thinking of making bracelets, but this idea came to me instead – I hope you like it! While this is an (unpaid) sponsored post, all content, opinions are and always will be my own. Cork Cords – Natural / Gold 10mm x 2mm (x 1 metre) – Flecks of gold on this natural cork flat cord are very pretty. It’s also available in silver. Soft to work and easy to cut with scissors. Buffalo Leather Lace – Whisky 10mm x 2mm (x 1 metre) – Rich colour, you will need a sharp scalpel for slicing this product. Round Leather Cords High Quality – Navy 5mm (x 1 metre) – Navy blue! Something a little different. I lightly sanded the side for gluing to ensure it adhered well. Scalpel for slicing. Cork Cord – Pastel White 10mm x 2mm (x 1 metre) – Natural cork again, with a white coating. Very pretty. Thicker than the natural cord with gold (above) – so you will need your scalpel. You could use just these products to make your Wall Hanging, but I mixed it up a little with some odd ribbons and trims I had on hand too. Glue Choose one suitable for gluing cords. I used Aldi Brand Craft Super Glue. Large Needle To pull the hanging thread through or poke through! 2. Work out your lengths to cut on the angle (chevron). This is an important step. 3. Note how you need to cut LONGER. The length is longer when horizontal. 4. Allow for this diagonal measurement to ensure you have enough length. 5. Finish slicing and cutting all your cords. Lay out and take a PHOTO! 6. Draw a centre line on your felt and start gluing. Get your angle right! 7. Continue gluing and check with a ruler that you’re even on both sides. 8. Finish by slicing the excess cord from the top and bottom after your final gluing. 9. Poke a small hole with something sharp, then thread your hanging cord through. 10. Tie a small knot and glue down firmly. 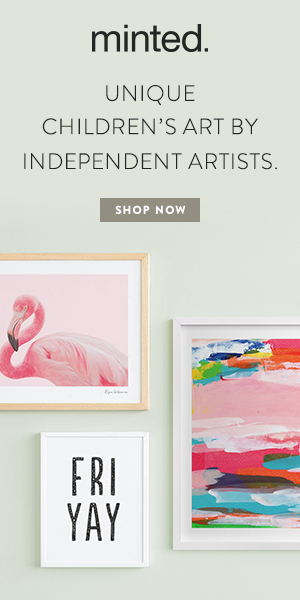 Display your finished piece! Note the tassel trim on the bottom. I glued this on, then the last piece glued down was actually the whisky colour (over the top part of the tassel trim) to neatly finish over the tassel trim. You may have some slight trimming on the side too – just slice and cut away any excess to keep the lines straight and neat at the sides. Thank You to Endless Leather. While this is an (unpaid) sponsored post (cords were supplied), all content, opinions are and always will be my own. DIY – Vegan Protein Balls – Vanilla Bean & Maple Flavour – YUM! Easy to make and easy to eat on the go, or for a healthy snack anytime, with the added bonus that these delicious Protein Balls have NO ADDED SUGAR! I have a confession to make. 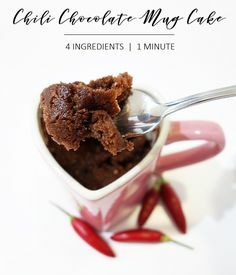 My last recipe Chili Chocolate Mug Cake back in February, was one of the last times that I ate a sugary treat. I found myself craving sweet things a little too often. I took some time to re-evaluate my diet and since then I’ve been eating a diet based less on snacks that should be eaten in moderation and I’ve been incorporating lots more ‘good’ greens. I made this change primarily to see if it would help some minor ailments (it has for me) but as a side note I’ve lost 10kg. I feel a lot more energetic. I’m not going into details about dieting here on this blog, or tell people how/what/when/where you should eat – it’s up to you, but I what I will share with you today is a simple recipe that I made up – for these Vegan Protein Balls. They are YUM! The protein mix is sweetened with Stevia. Prana Protein Powder. Vanilla Bean & Maple. I used the measuring scoop that comes inside the packet (for the protein powder) for all of the ingredients listed below. Almond Meal. I buy the Aldi Brand. LSA. Linseeds, Sunflower Seeds and Almond Meal. Purchased from Coles. Golden Flaxseed Flour. Purchased from Coles. Basically where I have said Protein Powder x 2 – that’s two scoops – using the scoop that came in the packet and continued using the scoop for the rest of the ingredients for consistency. If you don’t use this brand or have a different scoop, it will just be a case of taste testing. Just keep the ingredients in similar proportions and you should be okay. When it comes time to add the coconut oil – add sparingly until you get the correct consistency. Mix thoroughly and then roll into about 4cm balls = approx. 30g per protein ball. This mix will make about 12 balls. Refrigerating them will harden them a little to bite sized morsels of deliciousness 🙂 Picture above is just after rolling, so you can still see the ‘glisten’ of the coconut oil. I’ve tried to be as accurate as possible, but please don’t use this information if you are on any sort of strict diet, okay! 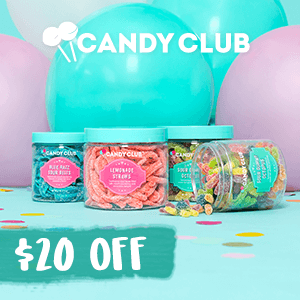 Please note: This was NOT a sponsored post for this or any other company. I tried it, liked it, shared it. FREE PRINTABLE Monstera Obliqua Print available in 8 x 10″ and 11 x 14″. I made it from an original photograph taken by me (of my beloved Monstera obliqua!) and tweaked it. Please credit if you use it somewhere, Thanks!